We examined the relationships between dissolved inorganic nitrogen (DIN),orthophosphate (PO4-P), dissolved organic nitrogen (DON) and dissolved organic carbon (DOC) flux and landscape characteristics known to control inorganic N export (human population density, urban land use and agriculture) and organic C export (soil C:N ratios, soil C (or N) storage and wetland cover) among 12 sub-basins of a suburbanizing basin, the Lamprey River basin (479 km2) in southeastern New Hampshire. Total nitrogen flux from the Lamprey was dominated by DON (1.27 kg ha-1 yr-1), with nitrate and ammonium flux of 0.50 and 0.13 kg ha-1 yr-1, respectively. Human population density was the strongest predictor of nitrate flux (see graph) among the landscape characteristics that we measured, and together with riparian agriculture, explained 88% (p<0.001) of the variance. Orthophosphate-P flux from the Lamprey was 0.05 kg ha-1 yr-1 and was not related to any of the landscape characteristics that we measured. Dissolved organic nitrogen flux was not related to factors that control inorganic nitrogen and was closely tied to dissolved organic carbon (DOC) flux (r2=0.83, p<0.001). 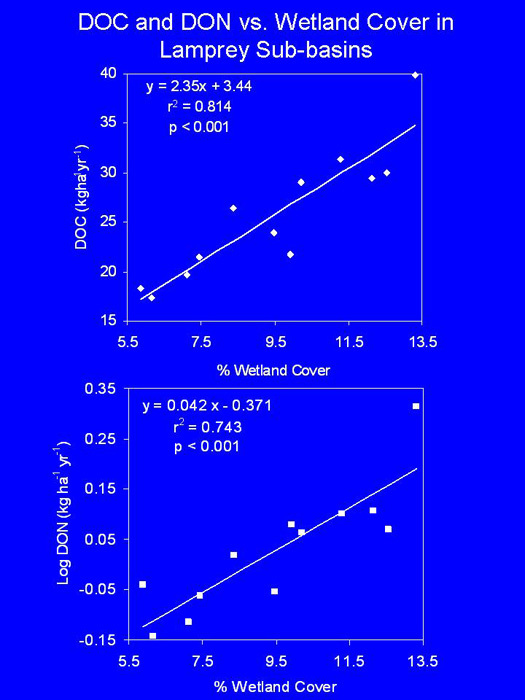 Basin wetland cover was the strongest predictor of both DON and DOC flux (see graph). In addition to basin wetland cover, soil nitrogen storage provided additional explanatory power in DON flux and together these variables explained 85% (p<0.001) of the variance. Despite the similarities between annual DON and DOC flux, DON and DOC concentrations behaved quite differently. DON concentration was negatively related to discharge (r2 = 0.41; p<0.001), but DOC concentration was not related at all. This implies that although the sources of DON and DOC are similar, their transport along hydrologic flow paths is somewhat different. Daley, M.L. Export of Dissolved Organic Carbon, Dissolved Organic Nitrogen and Nitrate from the Lamprey River Watershed, New Hampshire: Examining Relationships with Watershed Characteristics. Thesis, University of New Hampshire, Durham, NH. May 2002. Excess nutrient loading associated with increased human population density is anincreasing problem for suburban watersheds. Previous research has focused on either basin scale nutrient dynamics or small scale additions to understand instream processes. The impact of human population density on first order streams has largely been overlooked. In this study, 5 first order tributaries of the Lamprey River that have varying watershed population densities were sampled along a longitudinal profile. Each stream was divided into 6-12 sampling stations depending on length and flow conditions. Samples were analyzed for NO3-N, NH4-N, dissolved organic nitrogen (DON), total dissolved nitrogen (TDN) and dissolved organic carbon (DOC). The stream with the highest population density, which was completely dependent on onsite sewage disposal (L1) had the highest concentration of NO3-N, which increased significantly (p<0.05; r = 0.5-.96) from the headwaters to the mouth. As NO3-N increased, NH4-N decreased downstream with concentrations an order of magnitude smaller at the end of the longitudinal profile. Groundwater investigations were coupled with stream sampling for stream with the highest watershed septic system density and combined with a dilution gauging experiment. The results indicate that the increased N was entering the stream through groundwater as NO3 and not being retained or transformed. Concentrations of DOC in the stream were relatively constant throughout each of the tributaries. High concentrations of NO3-N in the developed sub-catchments are not seen in the main stem of the Lamprey, indicating that the mechanisms for retention and processing are scale dependant. Blumberg, J.E. Instream Nutrient Dynamics in Five First Order Tributaries in the Lamprey River Watershed, New Hampshire. Thesis, University of New Hampshire, Durham, NH. December 2002. Population density has been shown to predict water quality, specifically NO3-Nflux (kg ha-1 yr-1), both in New Hampshire and globally. Property value may also be related to water quality. We examined whether average property values per hectare can be used to predict water quality or if property value can explain the residual variation seen when population density is used to predict NO3-N flux. Thirty streams were sampled over a one year period, 14 in the Lamprey River watershed, 8 in the Oyster River watershed, and 8 in the Ossipee River watershed. Samples were analyzed for nitrate, phosphate, ammonium, dissolved organic nitrogen (DON), and dissolved organic carbon (DOC). The 30 sub-basins were characterized by land use data (NH GRANIT), population density (Census 2000) and property value. 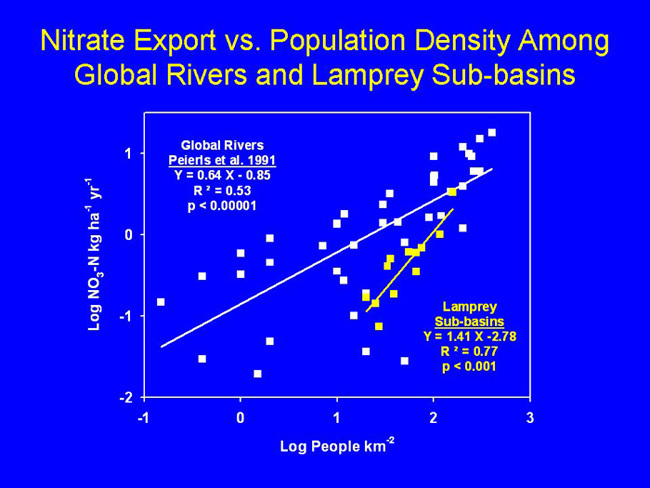 Population density was the best single predictor of nitrate export in the 22 sub-basins of the Lamprey and Oyster River watersheds that fall within the Boston metropolitan area (see graph). Ossipee sub-basins had the lowest population densities, but nitrate export was higher in the Ossipee sub-basins than in some of the Lamprey and Oyster sub-basins which had similar or slightly higher population densities. Urban land use was the single best predictor of nitrate export among all the sub-basins (see graph). Property value was the best predictor of ammonium concentration among all sub-basins and wetland cover was the best predictor of DOC and DON. O’Donnell, T.E., 2004. Suburbanization, Water Quality and Property Values in Three Northern Forest Watersheds. Thesis, University of New Hampshire, Durham, NH. and forested basins and the type of impact may differ according to land use. Very little is known about the chemical response to storm events in suburban basins. To help understand hydrologic flowpaths, hydrochemical processes and the importance of high flow events in suburban basins, stream chemistry was characterized in the Lamprey River basin during high flow events in the 2004 water year. Three sampling sites were chosen in the watershed, each having varying drainage area and discharge. Field measurements (pH, conductivity, dissolved oxygen and temperature) and stream samples were collected during each event to mimic the rise and the recession of the flow event hydrograph. Samples were analyzed for total dissolved nitrogen (TDN), nitrate (NO3-N), ammonium (NH4-N), orthophosphate (PO4-P), dissolved organic nitrogen (DON), dissolved organic carbon (DOC), dissolved inorganic carbon (DIC), total suspended sediment, particulate carbon, particulate nitrogen, silica and major anions and cations. Stream chemistry in the Lamprey basin was significantly influenced by storm generated streamflow over the water year. Storm event chemical response was dependent on the antecedent conditions in the basin, the amount and duration of the rain event and dissolved contribution from the unsaturated and saturated zones. The two sub-basins in the Lamprey watershed reacted independently of the main stem over the same storm event, responding locally to differing chemical and hydrologic conditions. Proto, P., 2005. The significance of high flow events in the Lamprey River Basin, New Hampshire, for annual elemental export and understanding hydrologic pathways. Thesis, University of New Hampshire, Durham, NH. Previous research has shown that landscape characteristics such as populationdensity and land use can influence surface water quality. Activities on the land surface can also impact groundwater quality and we examined this linkage by comparing groundwater quality in fifteen sub-basins of the Lamprey River watershed to various landscape characteristics. Groundwater was collected from unregulated homeowner wells in each of the fifteen sub-basins (188 wells total) and was analyzed for pH, conductivity, dissolved oxygen, nitrate (NO3-N), ammonium (NH4-P), dissolved organic nitrogen (DON), dissolved organic carbon (DOC), phosphate (PO4-P), arsenic (As), Uranium (U) and lead (Pb). Results show that mean sub-basin nitrate concentration is positively correlated to sub-basin population density (R2 0.34, p<0.05) and that one homeowner well exceeded the exceeded the US EPA drinking water standard for nitrate (10 mg N/L). Nitrate levels in 10 wells were greater than levels associated with increased risk of gastric cancer (4 mg N/L; Ward et al. 1996), and 28 samples were elevated above 2 mg N/L (a level that we would consider high and not from natural sources). Arsenic concentrations varied throughout the Lamprey watershed and wells with higher arsenic concentrations tended to be clustered according to bedrock type. Even within a bedrock type, however, neighboring wells can vary dramatically. One well exceeded the EPA limit of 50 μg/L prior to 2006, 15 wells were greater than the new 2006 EPA limit of 10 μg/L. Buyofsky, L.A., 2006. Relationships between groundwater quality and landscape characteristics in the Lamprey River watershed. Thesis, University of New Hampshire, Durham, NH. Wetlands are known sites of denitrification and instream wetlands could beresponsible for a significant amount of nitrogen retention occurring in the Lamprey watershed. Surface water chemistry was measured monthly at ten wetlands in New Hampshire from January, 2005 through October, 2006. An additional wetland was sampled intensively and only during summer-autumn, 2005, and summer, 2006. Nitrate, ammonium, dissolved organic nitrogen, total dissolved nitrogen, nitrous oxide, and dissolved organic carbon concentrations in surface waters immediately up- and downstream of the wetlands were compared and changes in concentration were modeled. Nitrate, total nitrogen, organic nitrogen, and organic carbon concentrations differed significantly between upstream and downstream sampling stations. Ammonium and nitrous oxide did not show strong differences between upstream and downstream during much of the sampling period. However, in late summer of 2006, nitrous oxide concentrations increased by three orders of magnitude. The models indicate that inflowing solute concentrations, season of year, and dissolved oxygen concentrations significantly affect changes in some solutes. Wetlands play a critical role in maintaining surface water quality in the Lamprey watershed. Flint, S., 2007. Impacts of Palustrine Wetlands on Surface Water Quality in the Lamprey River Watershed. Thesis, University of New Hampshire, Durham, NH. Rapid suburbanization has caused major land use transformation in New Hampshire, and contributed significantly to nitrogen (N) enrichment in aquatic ecosystems. However, we do not understand how increased nitrogen concentration in lotic environments affects key ecosystem-level processes such as decomposition. In this study, I measured the rate of in-stream leaf litter decomposition in four basins along a suburbanization gradient located in the Lamprey and Oyster River watersheds in southeastern New Hampshire. Basins varied in population density from 24 to 289 people km-2, and in-stream nitrate concentrations from 0.02 to 1.0 mg L-1 as N. A fine-mesh litter bag technique was used to quantify mass loss, substrate nitrogen and carbon content, fungal and bacterial biomass, and microbial respiration for senesced maple and oak leaves, pine needles, and grass clippings. Rates of decay (k) ranged from 0.0007 to 0.0173 day-1 across the different sites and litter species. Repeated measures analysis showed a significant interaction effect of litter species and time on decomposition. Specifically, maple litter had the highest rates of decay, oak and grass litter had similar and intermediate rates, and pine litter had the slowest rates. The effect of site was not significant on the decay of oak, grass and pine, while maple litter decomposed slower at the more suburban streams. Nitrogen content over time varied by species, but not by site, with N concentrations increasing in maple, oak and pine litter, and decreasing in grass litter. Changes in N mass over time differed by species, with pine gaining N, suggesting N immobilization, and maple, oak and grass loosing N over time, suggesting N mineralization. The effect of site was not significant on N mass dynamics of oak, pine and grass litter, while maple litter at the most suburban stream showed only nominal losses of N mass over time. Microbial biomass and respiration also varied by litter species, while site had no significant effect. The results of this study show that litter decay rates are not accelerated by nitrate enrichment associated with watershed suburbanization. This similarity of processing rates among the four streams suggest that either the ambient streamwater nitrate concentrations at all sites examined were sufficient to fully alleviate substrate-induced N limitation of litter decay, or that other physical or chemical characteristics at the more suburban sites negatively affected decay and masked the potentially stimulating effect of elevated streamwater nitrate enrichment. Bourakovsky, A., 2007. Influence of watershed suburbanization on leaf litter decomposition and microbial activity in four streams in southeastern New Hampshire. Thesis, University of New Hampshire, Durham, NH. In coastal New Hampshire as well as throughout the world there has been an increase in Nitrogen (N) loading to coastal areas. This increase in loading can be related back to human activity on land. Understanding the extent of coastal inputs is difficult because of the many sources of N in the watershed and because of sparse or unrepresentative sampling. Modeling is an important tool in understanding the sources of N in a watershed. In this research, the New England SPARROW (Spatially Referenced Regression on Watershed Attributes) will be applied to predict nitrogen loading in the Exeter, Oyster, Lamprey, Cocheco and Salmon Falls watersheds in coastal New Hampshire. By applying the same regression techniques to data collected from the NH Coastal region a more accurate model was developed. The New Hampshire coastal model predicted lower N fluxes for coastal NH than the NE SPARROW model, better characterizes land use coefficients and was based on more accurate local land use data. Characteristics in the coastal region were not described adequately by the NLCD data or the New England SPARROW model. TN flux predicted by the NH Coastal model better reflect monitored TN fluxes in the 5 great bay watersheds than the NE SPARROW model. There are however limitations associated with the NH Coastal model. The NH Coastal model was unable to measure stream loss from upstream sources and this coefficient was not measured directly but rather compensated for by other variable coefficients. This prevents the users from being able to measure stream loss directly. The other major limitation is that some data sources, soil permeability, atmospheric deposition and point sources, were taken directly from the NE SPARROW model and therefore do not account for any source increase that may have occurred. The final limitation is that only one calibration catchment contained a point source of N leading to potential errors with the point source coefficient. The New England SPARROW model should not be used to make water quality decisions for small coastal areas because its predictions may not be accurate. However, the model can be easily reworked to describe smaller areas. Legere, K. 2007. Nitrogen Loading In Coastal Watersheds of New Hampshire: An Application of the Sparrow Model. Thesis, University of New Hampshire, Durham, NH. Anthropogenic nitrogen (N) inputs in terrestrial and aquatic ecosystems can altergroundwater N cycling, which affects N fluxes in surface water and coastal environments. Increased N inputs can decrease the overall health of terrestrial and coastal ecosystems as well as pose serious human health threats. It is well documented that riparian zones can reduce N fluxes to surface water bodies as well as coastal environments. Recently, it has been determined that riparian denitrification potential is largely influenced by hydrogeologic characteristics. We evaluated hydrogeologic characteristics and groundwater physical and chemical properties in the James Farm well field located in Lee, NH, USA from 1995 to 1996, and 2004 to 2006. The constituents measured were nitrate, ammonium, total dissolved nitrogen, dissolved organic carbon, sulfate, bromide, chloride, sodium, magnesium, potassium, calcium, and silica. Patterns of nitrogen concentration in ambient riparian groundwater suggested that denitrification might be occurring as groundwater flowed through the center of the well field. The “push-pull” method estimates denitrification potential by adding different quantities of nitrate and dissolved organic carbon to riparian groundwater and comparing the rate of nitrate loss with the loss of a conservative tracer. Field experiments with the push-pull method, however, showed that substantial N loss did not occur even with large amounts of added nitrate and dissolved organic carbon. Short groundwater residence times may have been responsible for the lack of denitrification. Because human population density is significantly correlated with NO3-N concentrations in surface water and groundwater, and rapid growth continues to occur in the NH seacoast, an increase in NO33-N concentrations can be expected. It is essential to further examine denitrification control mechanisms to determine if riparian zones are important in regulating nitrogen loss from coastal New Hampshire watersheds. Traer, K., 2007. Controls on Denitrification in a Northeastern Coastal Suburban Riparian Zone. Thesis, University of New Hampshire, Durham, NH. Road salt use has increased substantially in the U.S. since the 1940’s. Much is known about the dramatic impacts this can have on urban streams; little is known, however, about the impacts on streams and groundwater in suburban areas. We quantified mean Na and Cl concentrations in a series of basins (1.3 to 853 km2) in southeastern and central New Hampshire (NH) spanning a gradient of developed land use. To infer the impacts of road salting on water quality, we examined the influence of basin characteristics such as % development, road density, % road pavement, population density and % impervious surface on spatial variation in concentrations of Na and Cl in both stream water and groundwater. Among all sampled basins, the single best predictor of spatial variation in stream Na and Cl concentrations was road density, km/km2 (r2 = 0.75, p<0.001for Na; r2 = 0.76, p<0.001 for Cl). For watersheds in central NH, % road pavement provided the best predictor of spatial variation in stream chemistry (r2 = 0.70, p<0.001 for Na; r2 = 0.77, p<0.001 for Cl). For watersheds in southeastern NH, impervious surfaces best predicted this spatial variation (r2 = 0.86, p<0.001 for Na; r2 = 0.92, p<0.001 for Cl). Using homeowner wells as sampling points, spatial variation in average groundwater Na and Cl among sub-basins was best predicted by sub-basin population density (r2= 0.34, p<0.05 for Na; r2 = 0.41, p<0.05 for Cl). Basins had surprisingly high mean Na and Cl concentrations in stream water, with Na ranging from 2 - 117 mg/L (median 9.6), and Cl ranging from 1-239 mg/L (median 15.2). In groundwater, Na ranged from 6-136 mg/L (median 15.9) and Cl ranged from 2-253 mg/L (median 28.7). Mean Cl concentration in one small stream exceeded the EPA chronic toxicity standard (230 mg/L) and 7% of the groundwater samples from private wells exceeded the secondary EPA MCL for drinking water (250 mg Na or Cl/L). Elevated stream water concentrations were not limited to winter months, and in many basins concentrations were highest during summer low flows. Our data suggest that road salting practices are contributing to the salinization of both stream water and groundwater even in basins that are disconnected from major highway corridors. If global climate change increases the frequency and severity of snow and ice storms as well as droughts, we can expect further salinization of water resources unless roadway maintenance practices are altered. Daley, M.L., Potter, J.D. and McDowell, W.H. 2009. Salinization of suburbanizing New Hampshire streams and groundwater: effects of road salt and hydrologic variability. JNABS 28(4). View the "Take home messages" of a presentation given at the 2009 2nd Annual Lamprey River Symposium. Low variant red maple floodplain natural communities are characterized by having few tree species and a dense herbaceous ground cover that is adapted to peridodic flooding and poorly drained soils. The purpose of this study was to better understand floodplain forest communities of the Lamprey River in Lee, New Hampshire. Five study plots were established to identify the growing conditions, including: soil, available light and flood dynamics. Herbaceous and arboreal composition was inventoried at each plot by measuring percent of herbaceous cover, tree dominance, tree density, and tree relative density. Four of the five plots showed high biological diversity of herbaceous taxa. Red maple (Acer rubrum) was the most common tree species, but with very low densities at four of the five plots. Gould A. 2009 Investigating Floodplain Forest Communities, Including Soil and Flood Dynamics: Lamprey River, Lee, New Hampshire. NR 795: Investigations in Natural Resources, UNH, Durham, NH. Floodplains act as both sources and sinks of nutrients to and from water bodies. This study will examine hydrologic and nutrient dynamics in an agriculturally-influenced and unregulated floodplain in the Lamprey River (Lee, New Hampshire). This research will investigate the effects of flooding on local stream water quality and chemistry and examine how chemical responses to flooding vary both temporally (e.g., seasonal cycles) and spatially (e.g., extent of flooding). Galvin, M., 2010. Hydrologic and nutrient dynamics in an agriculturally influenced New England floodplain. MS Thesis, University of New Hampshire, Durham, NH, USA. At elevated concentrations nitrate-nitrogen can significantly impair water quality, causing eutrophication. I am studying seasonal differences in biotic nitrate uptake and longitudinal patterns in sediment denitrification at an agricultural stream on the University of New Hampshire Organic Dairy Research Farm. The stream flows into the Lamprey River, the local drinking water supply, which discharges into Great Bay Estuary, a nitrogen impaired system. Dunlap, K., 2010. Nitrate dynamics in an agriculturally influenced New Hampshire headwater stream. MS Thesis, University of New Hampshire, Durham, NH, USA.